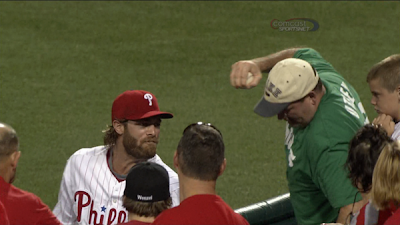 Zoo With Roy: Jayson Werth and Green Shirt Jorts Guy! (Yet Another) ZWR Exclusive! Jayson Werth and Green Shirt Jorts Guy! (Yet Another) ZWR Exclusive! So we all saw what happened with Wertz and jorts guy last night... it wasn't exactly great. But fortunately (and this doesn't always happen in life), there was a happy ending to the whole affair. ZWR sources spied the following scene at a local pub (<-- yo, it could be your actual name here if one of you donkeys advertised with us, for real), and I have to say, it choked me up a little. It may be sad, but one of my favorite parts of this thing is the powders blue/maroon stripe. Well that and Fargle Bargle of course. I love that the kid's on #4 already. I almost fell out of my chair I laughed so hard! I like how, rather than take off the baseball glove at the bar, Jayson switches it to the other hand. I think I've been to that bar. I like how Joe doesn't know what the Hulk Fist is.